Check out Latest Obituary Ad Rates of Sakal Newspaper from the below tariff table. The rates mentioned are in Rupees per square centimeter. This Table for Sakal Obituary Ad Rates provides you cost for Front Page, Back Page, Page 3, Page 5 and Inner Page Position for its various Editions. You can also download Sakal Advertisement Rate Card which is available in Pdf & Excel format. You can avail Special Offers & Discounts on this Tariff Rates. To get an Free Quote for Obituary advertising please email your requirement to [email protected]. Publishing Day All Days, Every week. Format for Creative Ensure you submit your Ad Creative in High resolution TIFF, PDF or PSD format. Track your Advertisement Once the Ad is confirmed for release, you will receive a notification and you can check your ad phyically or via e-paper on the schedule date. Once your Ad is released a soft copy would be shared with you within 3 days of release. Obituary Ad publishes on specific Page only. There is a special Page dedicated to Obituary Advertisement in Sakal Newspaper where Obituary and death related advertisement are published on concessional rates. Obituary advertisement in Sakal are published with various heading like Prayer Meeting, Sad Demise, Obituary, Condolence Meeting, Commemoration, In Loving Memory of, Shradhanjali, In fond of, Death Anniversary etc. Mostly this advertisement are published in a particular format with a Photograph. Sakal Obituary Ad Sample available with us which help you decide the advertisement content. Book Obituary Ads in Sakal Newspaper for Pune and other editions. Communicate your message to people through advertising in the Sakal Classified Column. Book Sakal Obituary Advertisement in newspaper and get spread the message about loosing your near and dear once. There is a special rate offered by the newspaper for obituary Advertisement. Also book following other categories advertisement in Sakal Today Chotya Jahirati Classified Section. Sakal Property Ad, Rental Ad in Sakal, Sakal Job Advertisement, Sakal Matrimonial Ad, Sakal Name Change Ad, Business Ad in Sakal Newspaper, Vehicle for Sale Ad in Sakal, Lost Found Ad in Sakal, Services Ad in Sakal, Travel Business Ad in Sakal Classified Ads published in Pune Newspaper. 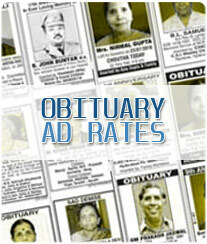 Check Obituary Ad Rates which are mentioned in Rupees per square centimeter for Sakal. Decide your Obituary advertisement size by calculating the rate multiplied by sq. cm. to suit your budget. Get the Obituary advertisement draft for the ad content ready keeping the decided size in mind. Send us the advertisement content & get a quote along with discount for Sakal Newspaper. Plan your publishing schedule for Obituary advertisement by checking booking essentials mentioned for Sakal newspaper. Upon receiving your consent on the Ad Rates quoted for Obituary Ad in Sakal, we will send you an invoice with every payment options available. Once the payment is received, our designing team would start designing your Obituary ad as per your requirements and it will get published on the chosen date in Sakal.